For approximately 22 hours, Arsenal were top of the league this weekend. They couldn't hold onto the top spot, of course, as the Manchester derby bore draw saw City climb back to first on goal difference, but the feeling is there. Arsenal, who were in dead last place after their opening weekend loss to West Ham, are now firmly in the title conversation with just over a quarter of the season played. Arsenal's form is truly the best it has been all season, which is why the League Cup brings a little bit of a bump in the road. You could see fatigue set in during the latter stages of Saturday's win over Everton and with Swansea away, Munich away, and the North London derby on the fixture list to follow, Arsenal will not get a better chance to rotate between now and the November international break. So, join me in the squad news section below for a discussion I shall call "Who the hell will we bring to Sheffield?" Yesterday morning, I was having a conversation with my girlfriend over whether or not Petr Cech would have to start. I was pretty certain he would not, with Matt Macey getting a look instead. At the same time, Arsene Wenger was giving a press conference where he said I was wrong and she was right. Macey is not ready to start and David Ospina is still out with a shoulder injury. It's a worrying thought: Macey isn't ready to play against the likes of Championship side Sheffield Wednesday, but is a heartbeat away from being Arsenal's starting keeper. Elsewhere, Per Mertesacker is available again after missing Saturday through illness; I would guess Laurent Koscielny drops, since he's the only center back to play all three matches since the last break. Perhaps Calum Chambers gets a game as well? Same for Kieran Gibbs and Mathieu Debuchy? The three of them all started (along with Mertesacker) in the last round. Arsene Wenger also added that there are no new injuries from Saturday, then added that Mikel Arteta remains out. I didn't know Arteta was out to begin with; he was on the bench against Bayern but not against Everton. There are some guys who need a rest in midfield: Francis Coquelin, Mesut Ozil, Santi Cazorla, Alexis Sanchez... I'd consider resting any number of them, though you can't drop too many and maintain any cohesion in your play. I would think some, but not all, of these guys will be on the bench to start. Predicted XI: Cech, Debuchy, Chambers, Gabriel, Gibbs, Flamini, Cazorla, Oxlade-Chamberlain, Campbell, Ozil, Walcott. cap, will start in goal. Number one and ex-Sunderland goalkeeper Keiren Westwood is not expected to start this match and Joe Wildsmith will deputize; Wildsmith recently earned his first England cap for the Under-20s in a win over the Netherlands. Defender Michael Turner (on loan from Norwich) and midfielder Alex Lopez (on loan from Celta Vigo) are definitely out injured, as are forward Marco Matias and midfielder Modou Sougou. There are also doubts over defender and club captain Glenn Loovens and midfielder Sam Hutchinson. Aside from those injuries and the rotation at goalkeeper, there's no reason to expect manager Carlos Carvalhal to deviate from his usual lineup; winning this match would be a huge scalp for the Owls. Assuming Loovens is fit, he'll start in the center of defense along with Tom Lees, while the fullbacks should be Jack Hunt and Daniel Pudil, both on loan from Premier League clubs. Sam Hutchinson, booked more times than any other Championship player, is on loan from Chelsea and should anchor the midfield if he passes fit. Their wingers should include Barry Bannan, formerly of Aston Villa, along with Ross Wallace while up top, Wednesday have struggled to find a regular goal scorer. The Owls have committed more fouls than any other club in the Championship and have scored one-third of their goals from set pieces, which should make this just as tricky as you'd think an Arsenal away cup tie against a Championship side would be. Predicted XI: Wildsmith, Hunt, Loovens, Lees, Pudil, Hutchinson, Lee, Wallace, Bannan, Joao, Forestieri. 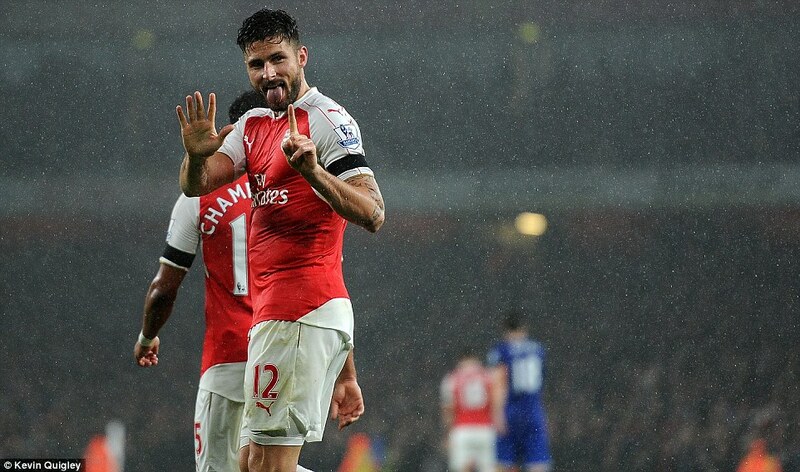 Olivier Giroud counts to six in the pouring rain. 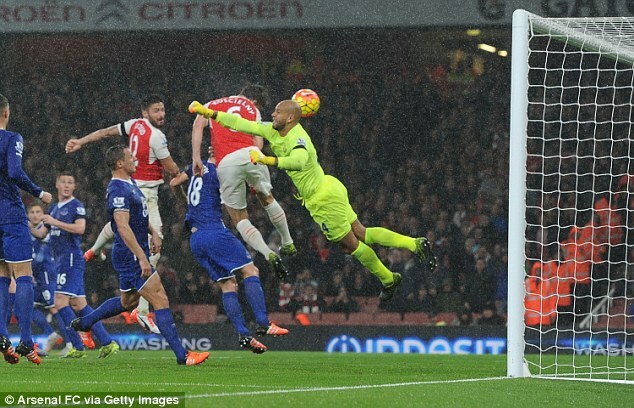 Arsenal extended their Premier League and overall winning streaks to five games over the weekend with their 2-1 win over Everton on Saturday. There's no doubting that this was a critical series of fixtures for the club and all signs seem to point to the fact that they have rounded into form at just the right time to mount a title challenge. At the same time, you have think that a match like this one disrupts that rhythm a little bit. The result here likely won't have much of an influence on the fixtures that follow, at least one would hope. Remember, even after losing in this competition to Bradford City in 2012, Arsenal responded with a three-match winning streak in the league. Sheffield Wednesday have not lost since September 12. They increased their unbeaten streak across all competitions to eight games with a 2-1 win over Rotherham United on Friday night. This eight match streak includes seven league games in the Championship, as well as their third round win over Newcastle United last month. The Owls now sit 9th in the Championship table, four points behind Birmingham City for the last playoff spot. Hillsborough; it's a screenshot from a YouTube video. 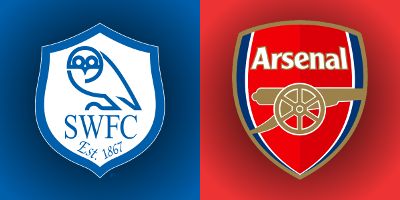 Arsenal have not played Sheffield Wednesday since the Owls were relegated in 2000. The Gunners have not won in any of their last six trips to Hillsborough, but again, since that all dates back to 15+ years ago, that's not a very relevant statistic. Still, you have to go back to August 21, 1993 to find the last time Arsenal won away at Sheffield Wednesday; Ian Wright scored in the 8th minute to give Arsenal a 1-0 victory. That win was just months after Arsenal defeated Wednesday in the 1993 FA Cup Final (in a replay.) Since then, Arsenal have two draws and four losses at Hillsborough. In fact, Arsenal have won just one of their last 12 overall against Wednesday at Hillsborough. But, again, this is all decades ago now. These clubs have met on five previous occasions in the League Cup and Arsenal have won all five. In January of 1983, the clubs met in the quarterfinals, with Arsenal winning 1-0, only to then lose to Manchester United in the semifinal. The clubs met again the 1988 quarterfinals, with Arsenal again winning 1-0; Arsenal went on to lose that final to Luton Town. That might sound absurd nowadays, but Luton Town finished 9th in the top flight that year. Arsenal and Wednesday met in the 1993 final, with Arsenal winning 2-1. Arsenal would go on to win both cups that season, both over Sheffield Wednesday. The clubs met again in the 1994/95 fourth round, with Arsenal winning 2-0. One year later, they met in the fourth round again, where Arsenal won 2-1. The referee is Oxfordshire-based Graham Scott. This will be Scott's first career Arsenal match. Scott was promoted to the Select Group this past summer, replacing the now-retired Chris Foy. There are only three Select Group officials who are older than Scott (who is 47): Neil Swarbrick, Roger East, and Phil Dowd. However, Scott has not yet worked a top flight fixture this year, as he comes back from a long-term injury; in fact, his only match this season was in the Championship, a 2-0 win for Burnley over Bolton at Turf Moor on October 17. The Owls saw Scott twice in the Championship last year, splitting those two matches. On January 17, the club lost 2-1 to Bolton; substitute Sam Hutchinson was sent off for picking up two yellow cards in 14 minutes. On March 7, Wednesday defeated Blackpool 1-0 at Bloomfield Road with Scott in the middle. In four matches overall, Wednesday have a record of one win and three losses with Scott as the referee. John Painting is a contributing writer to the Modern Gooner and is a seminal retrofuturist story. You can follow him on Twitter @zorrocat.